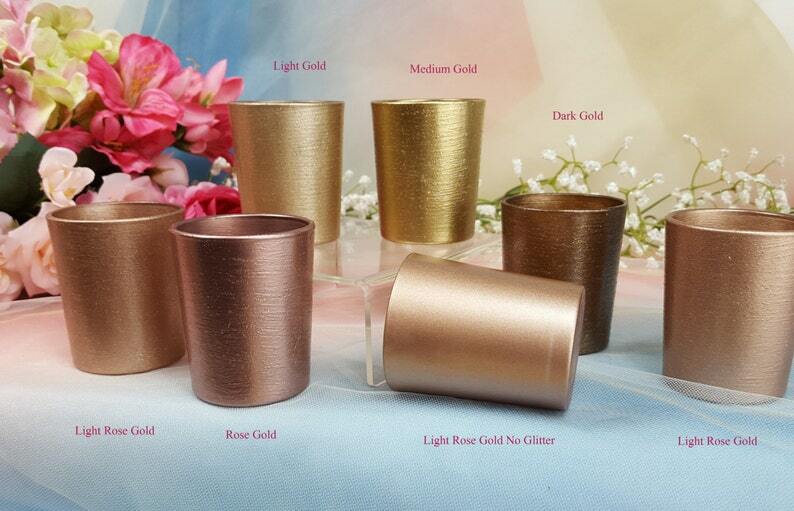 Custom Votive Candle Holders – 12 votives in this order - color of your choice. Beyond Stunning. They Shimmer and They Glitter! Shipping price is good for up to 5 orders. I need the amount you are interested in and the state where they will be shipped to for a true price. It will really help with your event date and what color you would like. Any questions, please message me. *** No glitter on your hands! I received 6 light rose gold votives, 3 dark gold rose votives and 3 yellow gold votives, plus 3 yellow gold mercury glass round votives (my personal fave). I love the color of the votives, but I wish the glitter coat was gold for gold or other metallic glitter instead of bluish/multicolored. The mercury glass votives are exquisite! I’d thought of using them just for Christmas decor like the others, but have kept them on display.